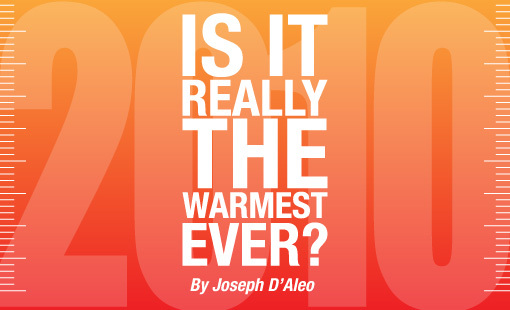 Was 2010 Warmest Year Ever? You can read this (link at source below) from Josepth D’Aleo who shows us why the claim made by the warmers that 2010 was the warmest year ever may be a big crock. It’s a thoughtful presentation that questions just what data is being used to arrive at this conclusion and why it may not be on the up and up. You can read his take on Urban Heat Index (UHI), placement of temperature stations and how “adjustments” made to collected data may show more warming than is really there. Both NOAA and NASA this month announced that 2010 was tied for the warmest year. The UK Climate Research Unit at East Anglia University proclaimed 2010 the second warmest year since 1850. Comments Off on Was 2010 Warmest Year Ever?